Helping our neighbors make Christ the center of their lives. The Crosspointe family searches out and partners with community outreach programs that not only match our statement of faith but also align with our purpose and strategic vision which focus strongly on families. As you visit the pages for the different programs Crosspointe is involved with, you will see common threads of family and faith as we work to lay a solid biblical foundation for those we serve. Incarcerated Youth Ministries screen and train volunteers as bible study leaders and chaplains and provide these services to area youth detention centers. Volunteers from Crosspointe visit the youth every other Tuesday evening (visit the C3 Calendar for dates and times). During the visits, our volunteers meet one on one with the young men and women, take prayer requests, read scripture, and share the gospel. Because the program is voluntary for the youth, they want to meet with the volunteers and are eager to talk, listen, and learn more about Jesus. Volunteers are fully trained and work with an experienced chaplain until comfortable meeting one on one with the youth. If you are interested in being a part of Crosspointe's IYM program, please contact Pastor Matt at or call the church office at 313.881.3343 for additional information. Did you know that half of all pregnancies are unplanned? Even planned, pregnancy can be overwhelming and that is why Pregnancy Aid of Detroit shares the love of Christ to women through free pregnancy tests, free emotional support, free ultrasounds, free classes, and more. Crosspointe partners with Pregnancy Aid annually by sponsoring a church wide baby bottle boomerang event. During the event, our Crosspointe family takes home an empty baby bottle. During the drive they fill it with change (bills and checks work, too!) and bring it back to C3. All the bottles are collected and our "change for change" is given to Pregnancy Aid to help fund their work with local moms, dads, and babies. Pregnancy Aid offers events and fundraisers throughout the year that many from Crosspointe attend and Crosspointe is blessed with updates about beautiful babies born to moms blessed by the support of Pregnancy Aid services. The Regent Park area of Detroit is just a few miles from Crosspointe. Decades ago, the area was a thriving, working-class neighborhood comprised of nearly 2000 homes filled with families and seniors. In recent years, Regent Park has become known for its poverty and hopelessness. Decades of disinvestment has plagued the community. Over 20% of homes have been abandoned or occupied by squatters and often drug dealers. The greater 48205 zip code which includes Regent Park has been recognized as Detroit's deadliest neighborhood. The goal of LifeBUILDERS is to rebuild this neighborhood through a three-pronged strategy of empowering the youth, reclaiming the neighborhood and the building of communitas (a Latin word that means an unstructured community where everyone is equal, it's the very spirit of community!). Crosspointe partners with LifeBUILDERS through a school supply drive in the fall and a toy drive near Christmas as well as coordinated volunteer efforts throughout the year as LifeBUILDERS requests our assistance for projects. In 2015 Crosspointe partnered with Samaritan's Purse to raise awareness and funds for the European refugee crisis through Refugee Crisis Response Day (RCRD); an interactive community event featuring special speakers, live action and interactive displays depicting the people and plight of the crisis. RCRD created a launch point for the Crosspointe family to foster a relationship with Hope for Arabs. Hope is an Arab speaking non-denominational Christ-centered church with the mission of serving Middle Eastern refugees in the Metro Detroit area. Although the relationship with Hope is somewhat new, Crosspointe is looking forward to growth and additional involvement with programs like Live Free, coming in the summer of 2016. For more information contact the church office at 313.881.3343. Originally founded in 1909 as a soup kitchen that provided church services, shelter, food and clothing for the homeless and downtrodden, Detroit Rescue Mission Ministries (DRMM) has changed and grown to meet the needs of the community. Today, DRMM offers services for men, women, and families including substance abuse treatment, transitional and permanent housing, job preparation and educational courses through a multitude of locations across Detroit. Crosspointe supports DRMM through budgeted giving, seasonal drives, and 5th Tuesday worship. Volunteers are always welcome to join the Crosspointe team as they visit the DRMM on the 5th Tuesday of the month to lead worship with the men at the main campus. For more information, contact the church office at 313.881.3343. Opportunity starts with reading. 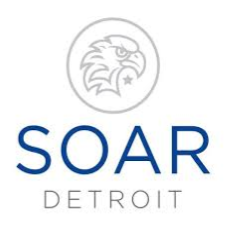 Crosspointe is partnered with Soar Detroit to provide volunteers to serve as one on one literacy tutors for children at an elementary school in Detroit. Soar Detroit has been successfully helping every willing child read at or above grade level. Soar students increase on average 2.3 grad levels after just one year in the Soar literacy program. Children enrolled in Soar receive one-on-one mentoring and an individualized learning plan prepared by a professional education specialist. Crosspointe volunteers are present twice a week tutoring upper elementary students. Additional volunteers and subs are always needed. For more information, contact the church office at 313.881.3343. Crosspointe is currently studying the book of Ephesians. If you've missed a lesson or would like to review a session of the series, visit the Sermons page to listen, download, or view.